A gold and blue enamelled brooch of elliptical form, the centre with a naval crown motif within a blue enamelled border, detailed '15', width 2.8cm, and a gold bar brooch, the centre with a naval crown motif, detailed to the back '9ct'. 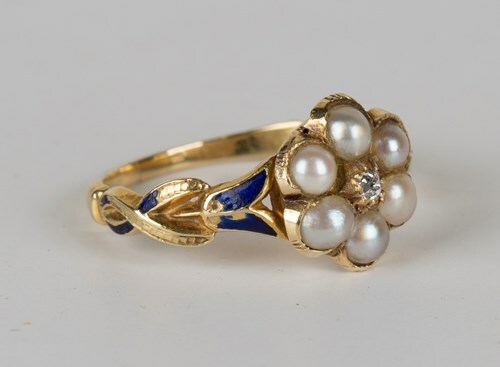 A Victorian gold, diamond, half-pearl and blue enamelled ring, mounted with a small cushion shaped diamond within a surround of six half-pearls between blue enamelled shoulders, ring size approx L, with a case. 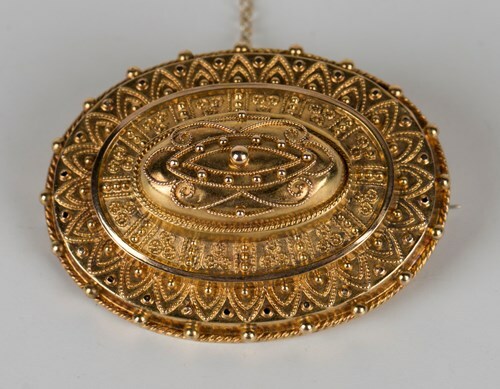 A gold and blue enamelled brooch with detachable pendant, the locket backed pendant designed as a naval hat, detailed to the blue enamelled tally 'H.M.S. 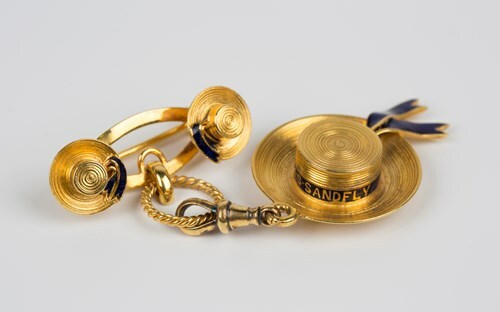 Sandfly', the top fitted with a swivel connecting to a brooch formed as two smaller naval hats, both detailed to the blue enamelled tallies 'H.M.S. Sandfly', length 6.7cm. A diamond, sapphire and ruby pendant brooch in a pierced openwork and foliate scroll design, length 6cm, total diamond weight approx 0.60ct, total sapphire weight approx 0.25ct, ruby weight approx 0.25ct. 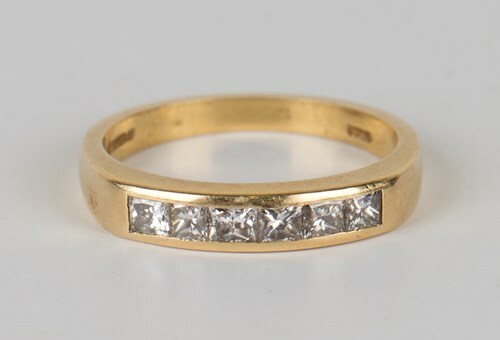 An 18ct gold ring, mounted with a row of six princess cut diamonds, ring size approx O1/2. 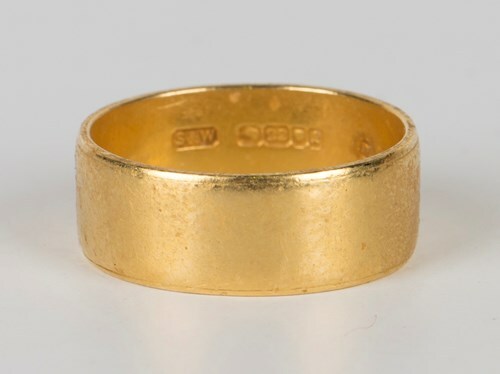 A 22ct gold wide band wedding ring, ring size approx O. 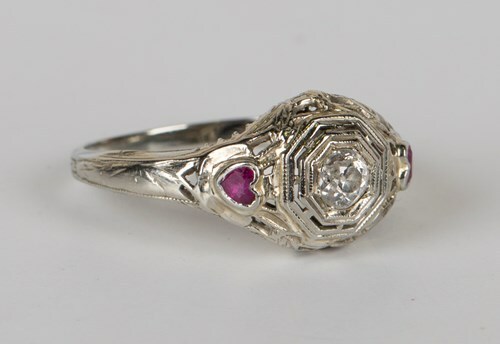 A white gold, diamond and red gem set three stone ring, mounted with the principal cushion shaped diamond between red gem set heart shaped shoulders with pierced decoration, detailed '18k', ring size approx L.
An 18ct gold, ruby and diamond five stone ring, mounted with three circular cut rubies alternating with two circular cut diamonds, Birmingham 1969, ring size approx L, and a gold, diamond and garnet set three stone ring, mounted with the cushion shaped diamond between two circular cut garnets, ring size approx H1/2, with a case. A pair of 9ct three colour gold concentric hoop shaped earrings, another pair of 9ct gold earrings and two odd 9ct gold earrings. A group of stacking rings, designed by Wendy Ramshaw, comprising four 18ct gold and moonstone single stone rings, all ring size approx M, two 18ct gold and cabochon amethyst single stone rings, both ring size approx M, and two silver rings, decorated with gilt beads, both ring size approx M, with maker's marks. 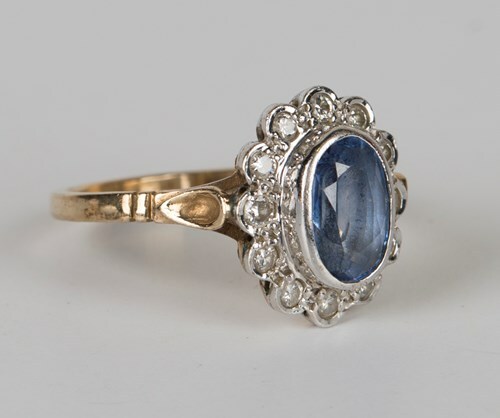 A 9ct gold, sapphire and diamond oval cluster ring, mounted with the oval cut sapphire within a surround of twelve circular cut diamonds, ring size approx N.
A 9ct gold and colourless gem set three stone ring, a 9ct gold and peridot five stone ring, a 9ct gold, garnet and cultured pearl cluster ring and two silver and marcasite rings. 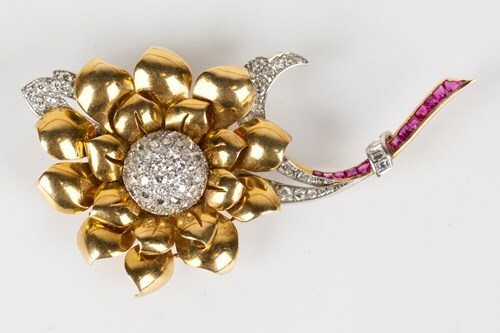 A two colour gold, diamond and ruby brooch in an open flower, leaf and stem design, mounted with circular cut diamonds and variously cut rubies, with a folding twin pin fitting, length 7.5cm, total diamond weight approx 1.30ct, total ruby weight approx 0.25ct, with a case. 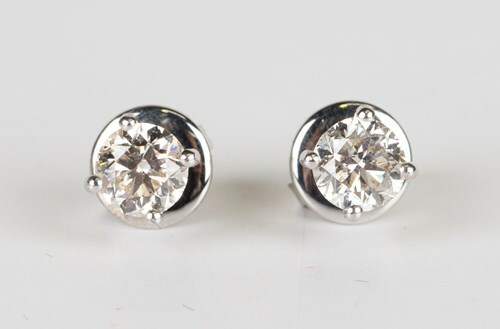 A pair of 18ct white gold and diamond single stone earstuds, each claw set with a circular cut diamond, with post and butterfly fittings, detailed '750', total diamond weight approx 1.00ct, with a case. A 9ct gold, opal and sapphire cluster ring (the central opal lacking), a 9ct gold, turquoise and cultured pearl cluster ring and a 9ct gold and oval cut pale blue gem set solitaire ring. A gold and pale green gem set solitaire ring, an 18ct gold and colourless gem set eternity ring, a 9ct gold wedding ring and another gold ring. A gold, platinum and diamond single stone ring, mounted with a circular cut diamond, ring size approx N1/2, and an 18ct gold, diamond and green gem set three stone ring, ring size approx N.
A gold, sapphire and diamond cluster ring, detailed '18ct', ring size approx L1/2, and a gold, emerald and diamond set rectangular cluster ring, ring size approx P.
A Victorian 15ct gold oval brooch with applied bead and wirework decoration in the Etruscan taste, the back with a locket compartment, Chester 1887, width 3.7cm, fitted with a safety chain. A 15ct gold bar brooch, mounted with a winged insect set with an amethyst and seed pearls, width 4cm, with a case, a 9ct gold bar brooch in an entwined snake design, with a case, and a circular rock crystal brooch.